Less than two weeks and counting until the Big Apple hosts the National Stationery Show in the heart of midtown Manhattan. 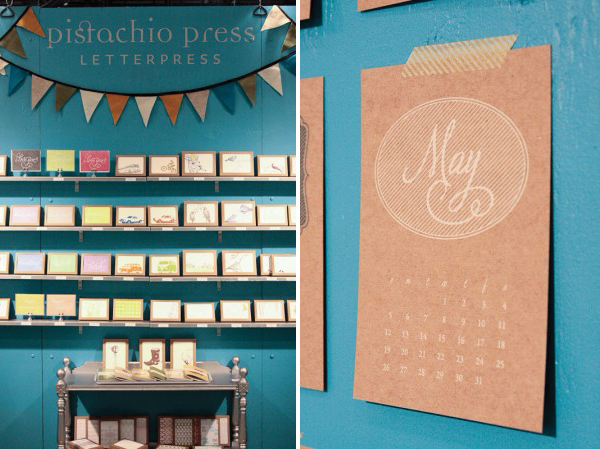 If you’re new to the show (either as an exhibitor or first time attendee), you’re in for a treat: the show hosts the latest and greatest in stationery & letterpress goods. Today we’re sharing some helpful tips & hints direct from NSS veterans themselves. If you have a tip you’d like to share, join in on the conversation and post it in our comments section! My tip is to remember that something will go wrong. Only you know what your plan is for the booth and for new product. Everyone else will love what you’ve done and once you’ve started meeting with buyers, you’ll forget that you were upset about not having enough time to finish that specific task. Also, remember that everyone else is stressed out, too. The camaraderie and friendships that are formed from this shared experience are really wonderful and unique to our business! Don’t underestimate the value of comfortable flooring (and shoes). Standing on concrete for five days straight can do a number on your body. Pack water and snacks to keep in your booth. You don’t want to be ‘hangry’ while helping customers! There is a lot of pressure and stress as you prep for the show. Be sure to treat yourself (and your booth neighbors) kindly. Our best advice to a new exhibitor is to find a reliable shipping company. In the weeks leading up to the show, several shippers will contact you and ask to give you a quote. Last year, we made the mistake of going with one of these random shippers because they seemed professional and had a good rate. Unfortunately, our shipment was partially lost en route, our booth walls were damaged, and the company threatened to sue when we demanded a discount. I recommend asking other exhibitors who they have shipped with. Go with a referral over a company you don’t know. Of course, your business card speaks volumes about your business, to this crowd especially. Have more cards than you think you will need. If your “nicer” cards are expensively produced, bring a back-up of something inexpensive to pass out to the masses. Second, I always visit the supply side first. There are so many great resources there, and the crowds tend to move into that area last. 1. On my first show, I forgot to create order forms with carbonless copies. It didn’t even occur to me that I’d have to have a copy of the order for myself and give one to the buyer as well. Most people probably already thought of this since it’s common sense but I’d never placed an order before – the NSS was, quite literally, my first selling experience! (if you need a reference for an order sheet, email me and I’ll share our version with you). 2. Another suggestion is to try to avoid using the FedEx at the Javits. They charge a fortune! There are a gazillion copy shops in NYC that charge regular rates, do great work, and turn stuff out really fast. 3. This suggestion is almost too late, but there’s still time to cobble something together. Make sure you have either a line sheet or a catalog. If this is your first show, don’t produce too many, 250 at the most. The worst problem you could have is to run out, but you can always make something inexpensive that can be reproduced at one of those inexpensive Manhattan copy shops while you’re at the show. 4. Put up a “Reps Wanted” sign at your booth but don’t have it hang out into the aisle. You may think you don’t want reps, but really – you do. I wouldn’t survive without my reps! 5. In fact, don’t create any signs that hang out into the aisle. Freeman will make you remove it. 6. On Saturday night, Freeman will lay down the aisle carpeting. If their carpet doesn’t come up to the edge of your floor tile, carpet, whatever – go to the Freeman service center (usually close to the LOUIE display) and put in a request to have a little piece of carpet put in to cover the cement floor. Make sure, however, you ask them really, really nicely. They’re happy to help but really appreciate your gratitude. 7. They don’t run the air conditioners during setup time. It can be really hot in the Javits, so dress accordingly. 8. There’s a secret place to buy food at the back of the Javits during setup time. I can’t remember the name of the place but it’s where all the teamsters buy their grub. It’s not fancy but it’s good food (and a lot less expensive than the food at the front of the convention center in those fake subway cars). 9. Since NSS doesn’t begin until Sunday, try to visit the ICFF (International Contemporary Furniture Fair) in the lower hall on Saturday. Your NSS badge will get you in for free and it’s amazing! 10. There’s this amazing Halal food cart at the intersection of 53rd and 6th. GO THERE! At one point, the Michelin food guide rated it one of the top 10 restaurants in NYC. There will be a very long line (maybe 50 – 75 people) but it moves very quickly (like, 10 minutes, tops). For $7 you will get a very, very tasty dish. Note: don’t get it to go – grab a seat and enjoy it there. You will find huge bottles of “white sauce” on the side of their cart for you to soak your dish in. It’s amazing! 11. If you’re coming in from an airport, either JFK, LaGuardia, or Newark and you’re on a budget, book a Super Shuttle bus in advance, online. It’s cheap, especially if you book a return trip. You have to, however, tell them in advance how many pieces of luggage you’re bringing with you. If you go over two, you might have to pay an extra fee (or tip generously). You can also take their shuttle bus. This is really inexpensive and will drop you off in the city. You’ll probably want to get off at Grand Central Station but it’s obviously going to depend on where your hotel is located. Don’t worry about it – grab a cab for the trip from Grand Central to your hotel – it’s probably going to be under $10 and totally worth it. 12. Get some padded flooring or cushy carpet for your booth. Your feet will thank you a thousand times over! 13. Make sure you take time to walk the show. I usually walk it on Saturday, late afternoon, or Wednesday morning. 14. Eat! Make sure you have a good breakfast and eat lunch! There will be people handing out menus for sushi and the like. See if your booth neighbor wants to join forces and order some take out. It’s usually pretty tasty and they deliver to your booth. 16. And lastly… it’s going to be difficult, but try to not compare yourself to those around you. Each company is going to experience (and benefit) from the NSS in their own unique way. Making sales isn’t the only goal at this show. Contacts, exposure, experience, conversations that might not lead to something right away, building relationships, blog exposure, media exposure, making friends, experiencing NYC, etc. – there are a lot of other ways that NSS will benefit you! Oh – and just because one company is having a “mad rush of sales” in the 1300 aisle on Sunday morning (and you’re not) doesn’t mean anything. There will be ebbs and flows in a variety of different areas within the show. What’s happening in one area isn’t necessarily what’s going on in the rest of the building. If you love what you’re doing people (and buyers) will be drawn to it. The card business is a more than $5 billion industry. There’s plenty of room for us little guys on those store shelves! 16.5. 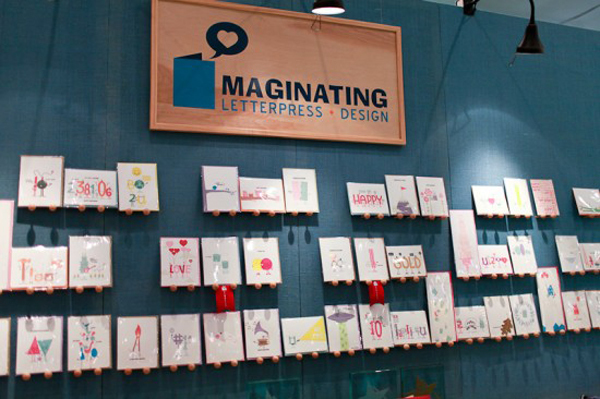 …come by the Maginating booth (2062) to say hi! Or email us at maginating@hotmail.com – we remember when it was our first show and are happy to help you in any way we can. If you have a tip for NSS that you’d like to share, join in on the conversation and post it in our comments section! This entry was posted in Letterpress Roundtable and tagged letterpress printers, National Stationery Show, NSS by Rebecca Miller. Bookmark the permalink. Thanks for all the great advice. I hope that we have remembered everything. This will be our first show. Booth #1351. I hope to meet you during the show.